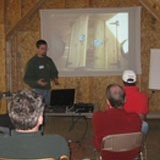 Your treehouse education begins with learning the basics about the trees you are working in. We focus on North American trees. 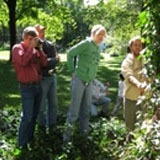 Expect to learn about basic tree biology, CODIT, pruning, tree health assessment, and choosing a good tree to build in. Understanding how trees grow and respond to the treehouse bolts we put in them is critical to minimizing the damage we do during construction. In relation to the biology discussion, we discuss predrilling holes in trees, layer by layer, so that you know what to expect. 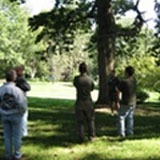 Later in the weekend, you will have a chance to practice on a nearby tree that is slated for removal. The TABs are really large and odd looking to the first time treehouse builder, and there are several nuances to how they are properly installed. All that to say that it’s better to practice on someone else’s tree in case you make a mistake. 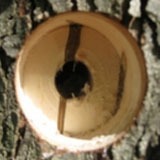 We have a few trees that we’re planning to remove for various reasons, and they are the practice trees for all manner of treehouse bolts & hardware. This is one of the most valuable parts of the workshop, so come prepared to take a turn with the drill and/or wrench, and take pictures for your future reference. Climbing is usually a part of treehouse building, even when the treehouse isn’t high in the air. 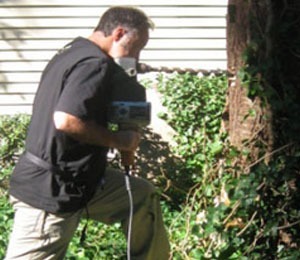 On uneven ground, ladders, & anytime you’re drilling into a tree, it is always safer to make sure you are tied in to prevent falls. We demonstrate a few of the climbing and rigging techniques we use here. You will have the opportunity to hoist yourself up in a tree and learn to position yourself for work and/or transfer to another tree without touching ground in the middle. Most first time climbers realize that it is harder than it looks, but practicing good technique can make it easier. 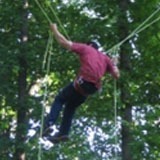 We also show you how to use pulleys to hoist some of the large parts of the treehouse into position. Treehouse design is simultaneously artistic and structural; an art and a science. While the basics of treehouse design are simple, creativity must be employed because trees are seldom found in a perfect arrangement and spacing. Ultimately, a proper design should incorporate the requirements of the end users, the possibilities offered by the trees, and the particular aesthetic appearance that is most fitting with the surroundings. There are a couple bridges built by workshop crews that you can walk across en route to a treehouse platform & zipline. We discuss the basics of bridge construction, the pros & cons of wood vs chain or cable, and various materials and styles of bridges. 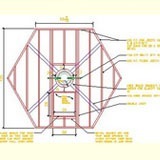 When it comes to zip lines, we review the concepts of sag, pitch, and span as they relate to staying within the safe working limits of aircraft cable. While we discuss theory and application openly, you may still need to consult an engineer if you are pushing the limits with a really large zipline. 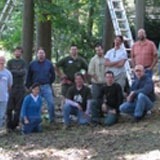 When you attend a workshop to learn how to build treehouses, you become part of our Family Tree. 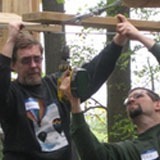 Some participants team up to build their treehouses together. Many call us back for follow up questions that arise during their projects. A couple have even returned for a second workshop. We generally draw very interesting people who often have a lot of expertise and experience to add to the learning environment. We hope you can join us at an upcoming workshop!